If you are thinking about entering the IT industry and not sure where to begin the CompTIA A+ qualification is a great place to start! The A+ is a gateway to your first job and to other more advanced qualifications. 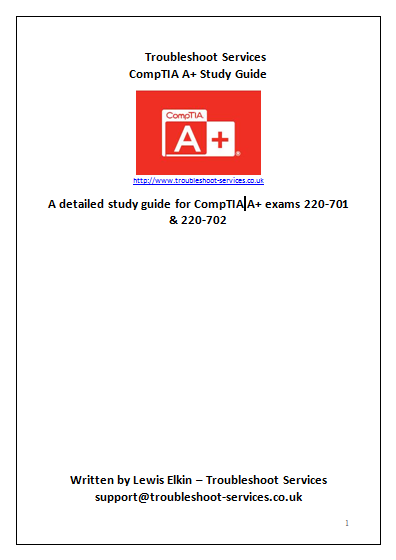 The CompTIA A+ qualification consists of two exams - the 220-701 (Essentials) and 220-702 (Practical Application). The Troubleshoot-Services A+ Study Guide contains all the knowledge you will need to pass both of these exams. This guide is aimed at helping you pass the exams without spending a fortune on a course. The best thing about our book is that it mirrors the content of the exams, meaning you will be spared from having to learn anything other than what you need in order to pass. Whereas other books over-complicate and try to impress, this concise guide gives you straight talking facts with easy to follow diagrams; even beginners will find this easy to follow. It’s all about ‘need to know’ rather than ‘nice to know’ and that’s what makes us unique.